The story in one sentence: A 911 operator receives a call from a girl that has been abducted and has to face a demon from her past. Storyline: Jordan (Halle Berry) is one of the greatest 911 operator in her team until she makes a fatal mistake which causes the brutal death of a teenage girl. The last thing Jordan hears is the killer’s voice saying, “It’s already done.” After this incident she decides to retire, and teaches the newbies instead. But during a demonstration one of her co-workers receives a phonecall from a girl who has been abducted and Jordan has to take over. Has she been abducted by the same man who has killed the first victim? Jordan has to overcome her fears from the past and react fast. 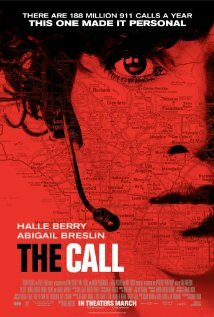 My review: All I heard about The Call was that it was a low-budget thriller, the advertisement was mainly through social networks and Halle Berry was the main character. This movie proves that you don’t need a big budget in order to make a great thriller. Why did this movie succeed with its relatively easy storyline? What I didn’t like so much were typical clishé reactions from some characters, which killed the mood every now and then. I saw many reviews that talked bad about the ending, which is kind of abrupt but totally unexpected. Without giving away any details, I think that the ending could have been a little more intense but none the less I was very pleased. I have even watched it twice so far. I think Halle Berry was made for acting in thrillers, her facial expressions are amazing. She needs more movies. Thank you sir! Hope to read more from you! Pingback: No One Lives – Probably not the best WWE ever released | Simon Says... WATCH THIS! Nice review. My main issue with the movie is toward the end, where the whole rescue operation turned to a complete, juicy revenger. It’s a bit far-fetched, knowing the characters. Halle and Abigail sells it, but I can’t say the same with the script. I guess I was just glad to see a fast- paced thriller with good actors after such a long time. How would you have ended it? I would have let horror man get some of his own medicine.